Larry Hachey, chair of the University of New Brunswick’s Board of Governors, is pleased to announce the appointment of two new members to the Board. Catherine Prosser and Deanna Graves-Brown have begun three-year terms as members of the Board of Governors. Together, they have more than 25 years of experience in a variety of industries, including government as well as not-for-profit and private organizations. In accepting appointments, Board members assume substantial responsibilities, including the strategic oversight, risk management, mitigation and fiduciary responsibility for the sustainability of the institution. The Board is composed of 44 members. The Board of Governors meets five times a year and its committees meet regularly throughout the year. The role of the Board of Governors is to approve and support values, vision, mission and strategic goals of the university and to monitor progress against the approved goals. The Board and its committees focus on governance, oversight and policy, including assessing the performance of the president, allocating financial resources and safeguarding the university’s lands and buildings. Deanna Graves-Brown is a chartered professional accountant. She holds a degree in business administration from UNB and an MBA from Laurentian University. She has also completed the Human Resources Management Program at UNB’s College of Extended Learning. Ms. Graves-Brown has spent more than 10 years working in industry for privately-owned New Brunswick companies and currently holds the position of comptroller for a Fredericton-based company. She has served as treasurer for the Saint John Board of Trade and is a former chair of FUSION Saint John Inc. She lives in Fredericton. 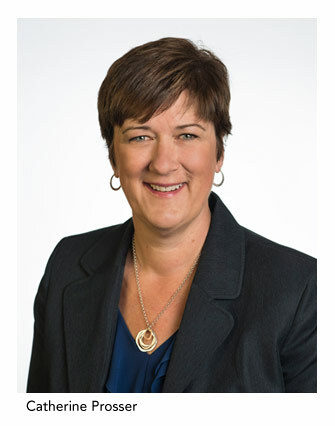 Catherine Prosser is an experienced finance and accounting professional from Saint John. Ms. Prosser is a chartered professional accountant as well as a certified internal auditor and holds a bachelor of business administration from UNB. She has provided advisory and assurance services to clients in manufacturing, service, not-for-profit and government sectors for more than 15 years. She has held various roles, including director of treasury and tax and director of financial reporting. Ms. Prosser has completed the CPA Canada In-Depth Tax Program, Six Sigma training and leadership and strategic communication training from the Ivey School of Business. She is currently a principal with Beers Neal LLP and treasurer for St. Joseph’s Hospital Foundation.